Ht / Wt: 6'2" / 214 lb. 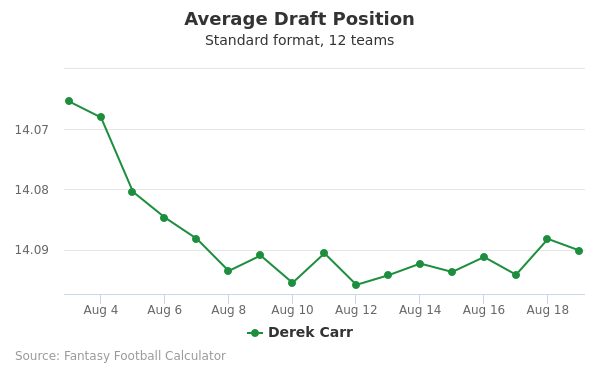 Derek Carr's fantasy value is measured by his average draft position (ADP) in fantasy football mock drafts. 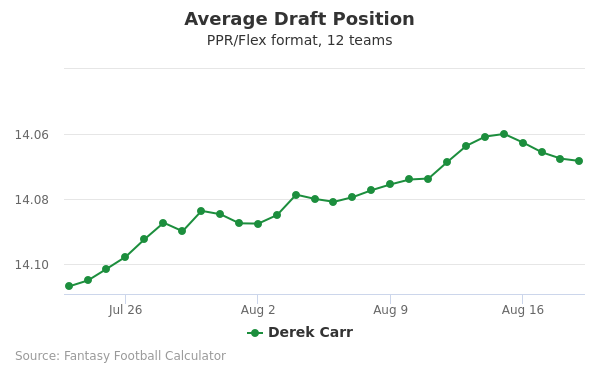 In recent drafts, Carr's current ADP is 14.07, which indicates that his fantasy outlook is to be the 7th pick of the 14th round, and 162nd selection overall. 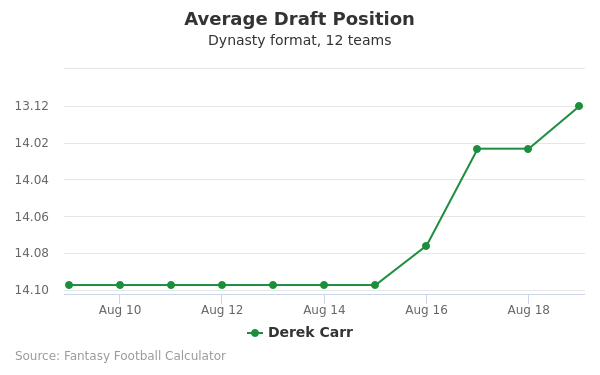 The code below will display a graph that updates every day to show the ADP data for Derek Carr for the past 30 days in 12-team PPR leagues. Draft Chris Herndon IV or Derek Carr? Draft Derek Carr or Quincy Enunwa? Draft Derek Carr or Marquez Valdes-Scantling? Draft Derek Carr or Matthew Stafford? Draft Derek Carr or Nick Foles? Draft Derek Carr or Jack Doyle? Draft Derek Carr or Nelson Agholor? Draft Derek Carr or Jalen Richard? Draft AJ Brown or Derek Carr? Draft Damien Harris or Derek Carr? Draft Derek Carr or Sam Darnold? Draft Derek Carr or Philadelphia Defense? Draft Derek Carr or Noah Fant? Draft Derek Carr or Robbie Gould? Draft Adam Vinatieri or Derek Carr? Draft Derek Carr or Jamison Crowder? Draft Derek Carr or Indianapolis Defense? Draft Buffalo Defense or Derek Carr? Draft Brett Maher or Derek Carr? Draft Derek Carr or Seattle Defense? Draft Derek Carr or Matt Prater? Draft Derek Carr or New Orleans Defense? Draft Derek Carr or Duke Johnson? Draft Derek Carr or N'Keal Harry? Draft Derek Carr or Stephen Gostkowski? Start Chris Herndon IV or Derek Carr? Start Derek Carr or Quincy Enunwa? Start Derek Carr or Marquez Valdes-Scantling? Start Derek Carr or Matthew Stafford? Start Derek Carr or Nick Foles? Start Derek Carr or Jack Doyle? Start Derek Carr or Nelson Agholor? Start Derek Carr or Jalen Richard? Start AJ Brown or Derek Carr? 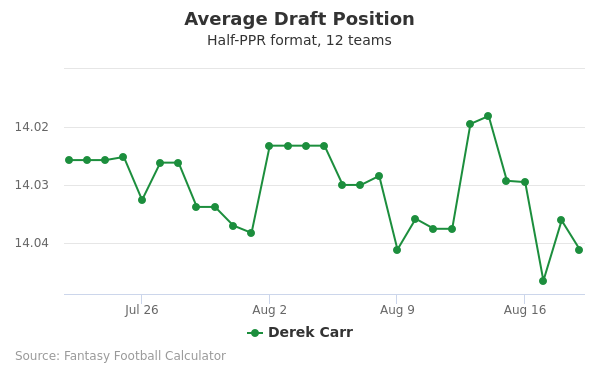 Start Damien Harris or Derek Carr? Start Derek Carr or Sam Darnold? Start Derek Carr or Philadelphia Defense? Start Derek Carr or Noah Fant? Start Derek Carr or Robbie Gould? Start Adam Vinatieri or Derek Carr? Start Derek Carr or Jamison Crowder? Start Derek Carr or Indianapolis Defense? Start Buffalo Defense or Derek Carr? Start Brett Maher or Derek Carr? Start Derek Carr or Seattle Defense? Start Derek Carr or Matt Prater? Start Derek Carr or New Orleans Defense? Start Derek Carr or Duke Johnson? Start Derek Carr or N'Keal Harry? Start Derek Carr or Stephen Gostkowski? Derek Carr is the starting Quarterback for the Oakland Raiders. Carr was an MVP candidate during the 2016 NFL season, but he broke his leg in Week 16. Carr hopes to recover in 2017 to lead the Raiders. Derek grew up in the Houston area while his older brother, David Carr, was QB for the Houston Texans. In high school, Derek initially played at Clements High School. Then, Derek and his family moved to California to finish school at Bakersfield Christian High School. During his senior season in 2008, Derek set records and received multiple awards. Included was the All-Area Football Player of the Year and National Player of the Year among private schools. After receiving multiple college scholarship offers, he chose Fresno State, where David also played college football. Derek waited two years before he was named starting QB. During his sophomore year in 2011, the Bulldogs only went 4-9 despite Carr throwing 26 TDs and 9 INTs. The Bulldogs built to 9-4 during his junior season when he threw 37 TDs and only 7 INTs. Then, during his senior season, Derek exploded with 50 TDs and only 8 INTs. The Bulldogs finished 11-2 and won the Mountain West Championship. But, they lost to USC in the Las Vegas Bowl. In his final college game, Derek went 29-54 for 216 yards with 2 TDs and 1 INT. The shaky performance against a program like USC created questions about his NFL ability. Derek was drafted in the second round by the Oakland Raiders. The Houston Texans needed a QB, but they skipped Derek because of his last name. In 2002 when David Carr was drafted #1 overall by the Texans, Derek famously stood on the stage with his brother and said that he would be there one day. He made it to the NFL, but not as a Texan. Derek signed a four-year contract with the Raiders worth $5.37 million. The rookie salary included a $2.2 million signing bonus. Before the Draft, he was undervalued because of perceived limitations. The official grade at the NFL Combine was a 5.8. This translated to "having a chance to become an NFL starter." But, scouts at the Combine did not see him developing into an elite QB. During the Combine, Derek was a top performer in the 40 Yard Dash, Vertical Jump, and 20 Yard Shuttle. His 40 time was 4.69 seconds and his vertical leap was 34.5 inches. The results did not matter to some decision-makers who labeled Derek a potential bust because of David's career. After the NFL Draft, Derek won the QB job and started all 16 games in his rookie season. But, the Raiders went 3-13 as he tried to adjust to the NFL. And, having a lousy roster did not help. Jack Del Rio took over as Raiders head coach and Derek flourished. The Raiders improved to 7-9 and he threw 11 more TD passes than in 2014. But, he threw one more INT than his rookie season, showing room for improvement to earn his salary. Like at Fresno St., Derek blossomed in his third season. The Raiders rebuilt the offensive line and led the AFC West for the majority of 2016. But, Derek tore his leg in the 15th game of the season. The Raiders then lost their final game, which cost the team the division. They followed that by losing in the Wild Card Playoffs Round against the Texans. Derek finished the season with MVP-caliber numbers of 28 TDs, only 6 INTs, and a passer rating of 96.7. One of the highlights of the season was throwing for more than 500 yards in one game against the Tampa Bay Buccaneers. Derek Carr is married to his wife Heather and they have two sons. Derek is a strong Christian and is heavily involved in local California communities. He wears #4 to honor his all-time favorite QB, Brett Favre. Derek's Raiders jersey can be found on the NFL Team Shop. He is on Twitter @DerekCarrQB.